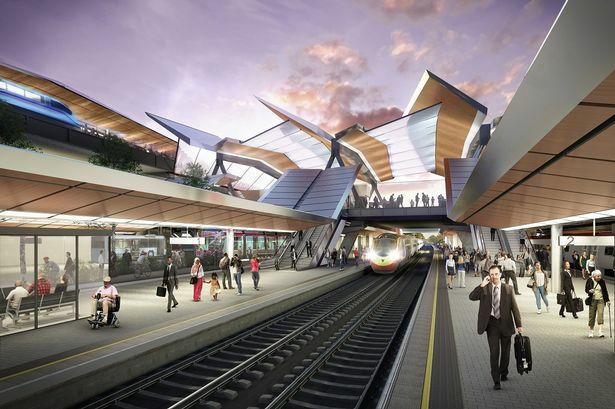 The region&apos;s public transport network was back in the headlines in May when new designs were revealed for a £286 million revamp of Birmingham International station in Solihull. The project is hoping to tap into the benefits of having the HS2 Interchange station nearby and the designs were released as transport chiefs secured £9.27 million in new funding. The vision is to create a transport exchange, bringing together existing rail, future high-speed rail, air, trams, buses, rapid transit, private vehicles, taxis, bicycles and an automated people mover to create seamless connections with Birmingham Airport and HS2. The fresh capital is being used to appoint consultants to progress the technical design of the station and contractors to design and build it. A long-running dispute between jewellers and the city&apos;s historic Assay Office finally came to an end in May. The pair had been locked in battle over the use of Birmingham&apos;s famous anchor mark by the Assay Office&apos;s operation in India. After lengthy consultation by the Government, it was decided that UK assay offices must distinguish jewellery items assessed here and those by its officers in overseas bases. The jewellery industry had expressed fears that overseas assay workers would not apply the same level of due diligence as those working in the UK. Heavy metal fans were being offered a slice of Black Country musical history after administrators placed a share of Judas Priest&apos;s back catalogue on sale. Buyers were being sought for a portion of the rights of 136 songs, including famous tracks like Breaking The Law and Living After Midnight, said to be worth between £250,000 and £300,000 a year. The move followed the administration of Ken Downing Ltd, the company owned by former Judas Priest guitarist and co-founder Ken &apos;KK&apos; Downing. The rights placed on sale represented the share of the band&apos;s back catalogue belonging to Ken Downing Ltd which, along with sister companies that owned a Shropshire estate and golf course, were placed in administration in October 2017. New life is set to be breathed into a former city council office block after it was announced in May that a property group wanted to convert it into a hotel. Native is behind the project to turn Louisa Ryland House into a new aparthotel. The grade-II complex is a cluster of three Victorian buildings behind Birmingham&apos;s iconic Council House but they have been empty since they were sold for development in 2014. It is hoping to create 173 aparthotel units, where the rooms have kitchenette facilities, alongside ground-floor space for a restaurant, coffee shop, fitness studio and drop-in office facilities. After months of headlines about a possible Clean Air Zone coming into force in Birmingham, firm details of the scheme were finally unveiled this month. It was bad news for drivers of older diesel and petrol cars and certain types of vans, buses, taxis and lorries. But more modern cars, including clean diesel engines, would be exempt from the charge under the plans which will affect journeys coming inside the A4540 &apos;middle ring road&apos;. Birmingham City Council is hoping to have approval to proceed and confirmation of government funding in February with the charge coming into force on January 1, 2020. An airline scrapped two transatlantic routes out of Birmingham - one of which had not even started operations - because of the late delivery of new aircraft. Latvian carrier Primera Air had been running a major offensive on the Midlands market by announcing several new routes during the preceding year. But in June it said the new direct service to Toronto would not commence and the Newark route was cancelled after just one month of operating. Primera Air hinted they could both return in 2019 but a month later it delivered another blow by announcing all of its European services from Birmingham would cease by the end of October. A new western orbital motorway bypassing the Black Country and aimed at easing congestion was outlined this month. It was part of a 20-year vision for the motorway network around Birmingham which also included more park and ride schemes and better information to help drivers avoid jams. The &apos;Western Orbital&apos; link would stretch from the M5 near Bromsgrove to the M6 and M54 junction north of Wolverhampton. It would cut traffic travelling through the Black Country by about 20 per cent, easing both congestion and cutting pollution, according to transport chiefs. Cyclists received a boost in June after £1.3 million was granted to improve a notoriously busy junction in Edgbaston where a doctor was killed. The Department for Transport granted the capital to build a new cycleway at the junction of Pershore Road and Priory Road near Edgbaston cricket stadium alongside improvements to road markings and pedestrian crossings. In October 2017, Suzanna Bull, a doctor at Birmingham Children&apos;s Hospital, died after being hit by a lorry at the busy crossroads which prompted calls for more to be done to ensure the safety of the city&apos;s cyclists. Work is well under way on two other cycle schemes, on the nearby A38 from Selly Oak to the city centre and the A34 between Perry Barr and the city centre.